30 July 2015 Wage Garnishments Jennings. MO Sylvester and Gladice Clayborn fell into debt when Gladice had a heart attack and had to have a bypass surgery. The couple recounts their experiences with Missouri Sewer District in their Cozens Avenue home in Jennings, MO. 01 August 2015 Wage Garnishments Jennings. 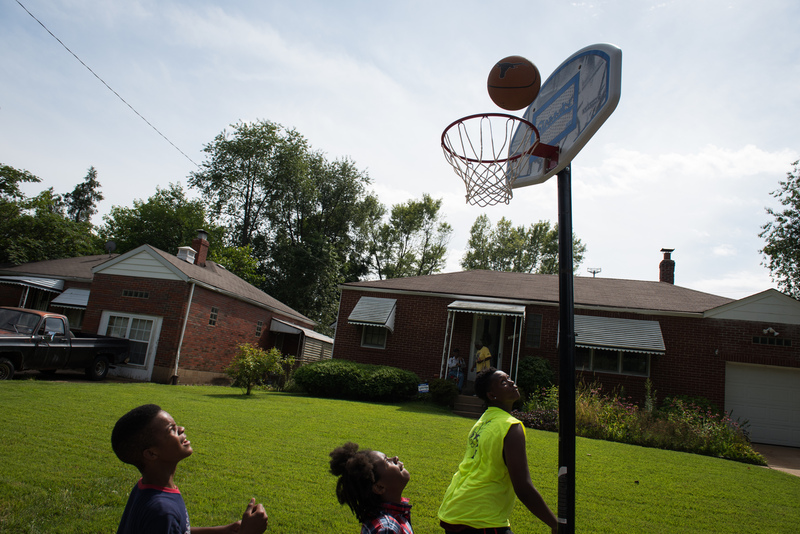 MO Children play basketball during a block party on Greenbrook Dr. on Saturday. 01 August 2015 Wage Garnishments Jennings. MO Residents of Greenbrook Dr. enjoy a block party on Saturday. 01 August 2015 Wage Garnishments Jennings. MO A general view of homes along Cozens Ave. in Jennings, MO. 01 August 2015 Wage Garnishments Jennings. 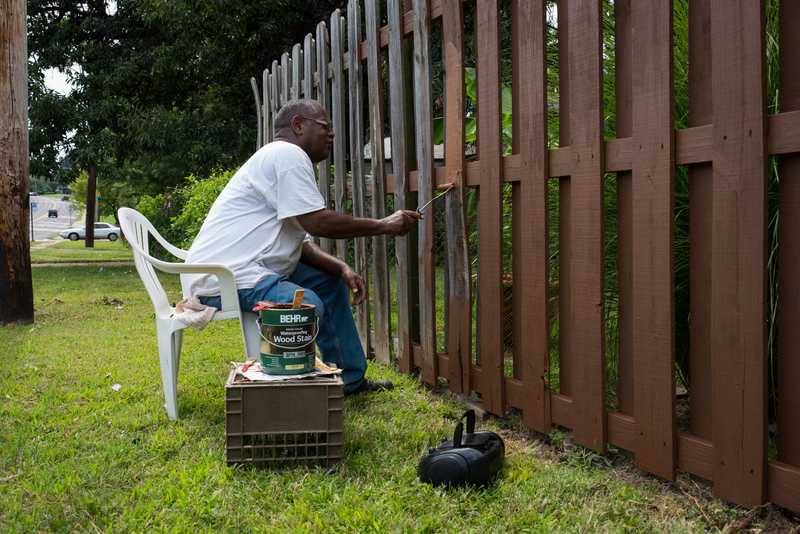 MO Everett, a resident of Jennings, paints the fence of his home on Saturday. A standout entry that was well-packed with on-point audience involvement. 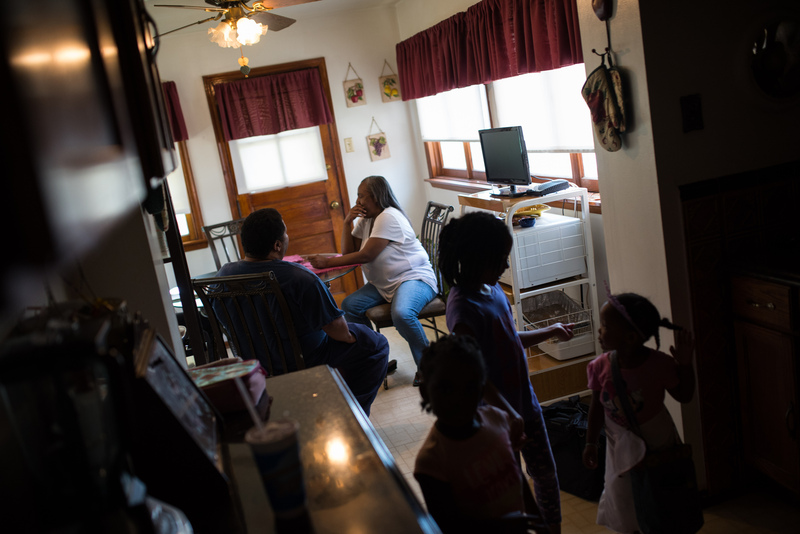 Two years ago, Paul Kiel uncovered that debt collectors, banks, even nonprofit hospitals were seizing the paychecks of debtors on a staggering scale. One out of every 20 American workers earning between $25,000 and $40,000 per year had a portion of their wages taken over by a consumer debt. But Kiel had a hunch that something more troubling was at work. He suspected that blacks were being sued over debts much more frequently than similarly situated whites. 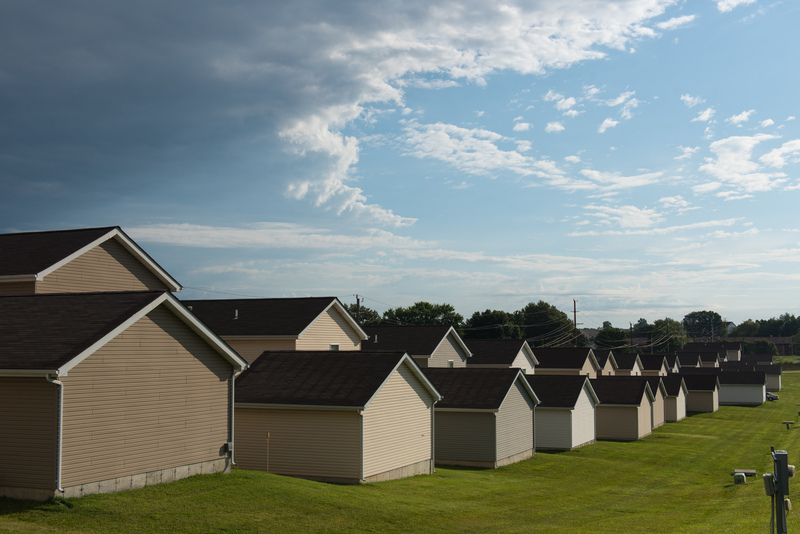 There was no pre-fab data to work with, and no studies, despite the unspooling national battles over racial inequality. Kiel and data reporter Annie Waldman launched a first-of-its-kind analysis from scratch. Kiel found state courts in three metropolitan areas, St. Louis, Chicago and Newark, that allowed him to gather every court judgment over a debt over a five-year period. Then he and Waldman analyzed nearly a half a million lines of court case data to gather information about each defendant. Using census tracts, they mapped the defendants and added information about race and income, then employed more sophisticated methods to control for income and other variables. The results were shocking. Even accounting for income, the rate of court judgments was twice as high in mostly black neighborhoods as it was in mostly white ones. And no one knew about it – not the residents of those neighborhoods, not the judges handling the cases, not the advocates for the poor or the elected officials. 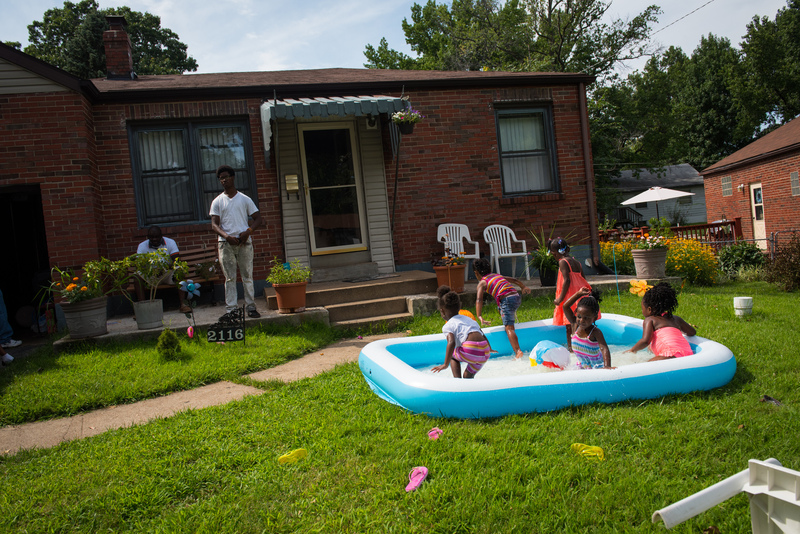 Kiel and Waldman, working with news applications developer Al Shaw, revealed their findings in a compelling narrative, in snapshots of neighborhoods and in powerful, disturbing maps. Their methodology was reviewed by top academics and meticulously explained in a well-received white paper. The project became an online sensation. The reaction was swift. Both the St. Louis American, the region’s primary black newspaper, and the St. Louis Post-Dispatch ran the story and both wrote editorials. Media outlets across the country picked up the story. Kiel appeared on a panel with the co-chair of the Ferguson Commission and narrated a segment retracing his reporting for This American Life. Using blown-up shots of ProPublica’s maps, Missouri Attorney General Chris Koster proposed a series of changes to state court rules to curb what he called “abusive” collection lawsuits that saddle debtors with illegitimate debts. Last year will be remembered in large part for its spate of police shootings involving black men, for its rekindling of racial tensions and for the embrace of Black Lives Matter. Kiel and Waldman’s work shows the systemic, hope-killing reasons why the anger is so great and why any discussion of inequality needs to go well beyond the justice system.